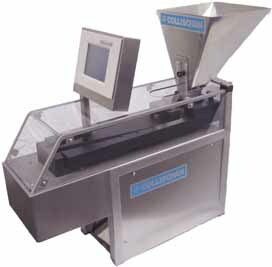 The MiniCount is universal counting machine for all kinds and form of tablets, capsules, dragees etc. without changing parts. The construction is based on the stringent requirement of the pharmaceutical industries and is easy to clean, because all contact parts can be removed tool-free. The MiniCount Counting Machine is controled by new Control Processor designed for this application. The operator can execute applications via a touch screen control panel. - a transport dust cover.